It's a little known fact that the Silver Surfer got his name because he once drank a whole canister of furniture polish, whilst dancing about on a beach located somewhere in Poland. Wait a minute! Was that the Surfer? Or was it Mark Waid and Chris Samnee sometime in July, 2013? Damn it. I best ask Marvel Comics. They might be able to answer this silly question for us. Using GENERAL terms, answer the following 4 questions about this STORY entitled 'Help Wanted'. 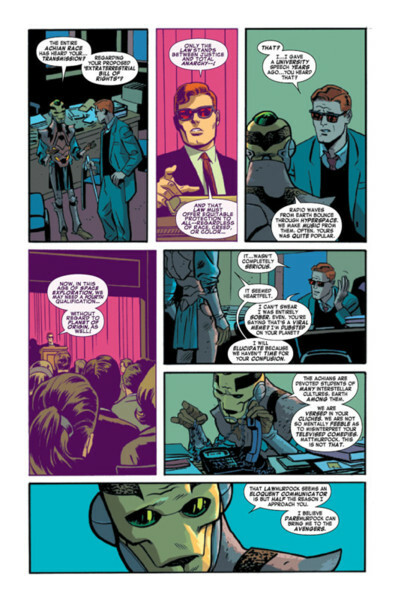 WHAT'S THE MAIN THRUST OF THIS TALE: So there he was, an alien called Ru'ach, talking to Matt Murdock about a problem he was having in space. When suddenly, out of the blue -- THOOOMM! -- the Silver Surfer shows up, ready for a reckoning. ARE THE MAIN OBJECTIVES ACHIEVED: Yes. Yes they are. Just not in the way you might think. ANYTHING ELSE HAPPEN: D.A. Kirsten McDuffie joins the team of Nelson and Murdock. HOW DOES THIS STORY END: With a lie wafting in the breeze. Picture the scene. Matt is talking to an alien in his office, when suddenly, in a somewhat dramatic fashion, the Silver Surfer makes his presence vividly known to all in sundry. Bwa-ha-ha-ha! What a clown! I love this type of jovial dialogue I do. It's what makes this medium that little bit extra special. (+) In my most humble opinion, Chris Samnee does his best Jack Kirby impersonation throughout this entire tale, folks. Plus the bigger the panels, the bolder and more dynamic the spread. Especially that one where DD and SS ride together on the surfboard! Wow! Talk about an amazing image or what! It was out of this blooming world. 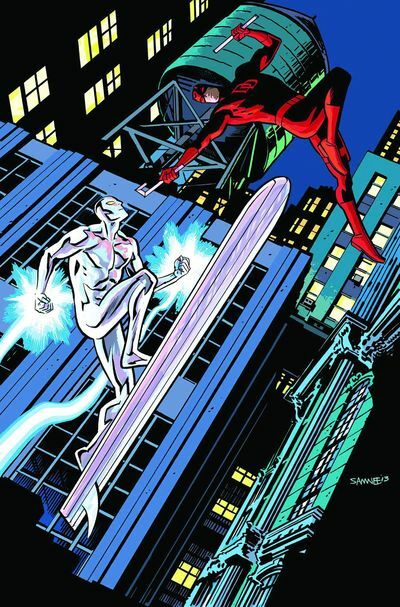 (+) If you're the type of a person who doesn't like Daredevil and Silver Surfer appearing in the same comic book, then you need you head read. Got it. You're a nut. You're a pistachio. You're a plonka. And you should seek guidance post haste or else you may end up as a cashew. (+) Now who isn't thrilled to see D.A. Kirsten McDuffie back in action again? Go on. A show of hands please. What? No one? Hmmm. That's good. As she is a great character, plus I'm pretty damn certain her addition will make this book that much more titivating by default. (+) I did love reading all of that cosmic stuff and nonsense surrounding Ru'ach's character. In many ways he reminded me of some sort of old school space-alien from a fifties b-movie. He was cheesy. He was cute. And he was a poxy liar that needed to be caught. BOING! (-) OK. I know this might sound a bit tetchy for yours truly. Yet the only thing about this escapade I wasn't too keen on was how it was rather too simple as a tale in its own right. Step One: A problem was presented. Step Two: The problem was given some more classification. And Step Three: BOOOF! -- BANG ! -- WALLOP! -- FINITO! Say no more. RICHARD NIXON AS RU'ACH: Well, let's face it. Both of these chaps are known for two very specific reasons. Firstly, they have the ability to tell untruths. And secondly, most of the time they both look constipated. See? Cased closed. D.W. GRIFFITH AS THE SILVER SURFER: Now if you don't know who DW is, let me just say that he was a pioneering American film director that made the 1915 classic -- 'The Birth of a Nation' -- and was known to have been aloof, despondent, and sometimes away with the fairies. 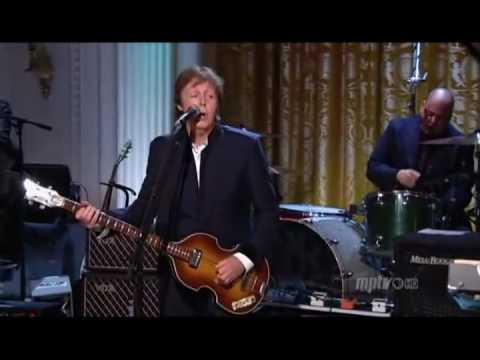 'EBONY AND IVORY' BY PAUL MCCARTNEY AND STEVIE WONDER: Oi! Hold up. Before you start laughing at my comparison, folks, please take note that this song and this story are very tonally similar where character and pathos are concerned. Go on. Click on the video provided to hear what I mean. Nice entrance, pal. I hope you've brought your wallet. Oh, hello! Do you come here often? Wait a sec? Weren't you in that movie with Jessica Alba? Don't you have doors in outer space, chrome-dome? Are you Terminator 2's cousin? And if so, can you get me Arnie's autograph please? Hey! Didn't you know it was illegal to ride a surfboard indoors? Are you lost? Or would you like to get lost? Do you want to consolidate all your loans in one secure monthly payment? Never in my life have I seen an entrance like that before. Now f*ck off! Boy! You're a shiny one, aren't you? So shiny in fact, that you've reminded me to punch this alien schmuck right in the face. THUNK! Anyway. That's enough of my sh*t for this month, folks. All I have left to say is that overall this issue of 'Daredevil' was a great one to read. The art was superb. The story was simple. The characters had character. And all in all I can't wait to see what Mark and Chris come up with next month.